When I was a child and we were living in Sacramento, one of our babysitters was a foster parent. She had a wide variety of Kids. Some with physical or mental disabilities, some who were troubled, and some who just wanted a place to call home. This is where I first found my love for working with Kids. In 5th or 6th grade, we got the opportunity to be "Student Helpers" in the younger kids classrooms. Instead of helping in the kindergarten or 1st grade classrooms, I asked if I could go help in the Special Education room, and so that's what I did. and I loved it. I did the same thing in Middle School and I fell even more in love with it in High School. I made some of my absolute best friends working in these classrooms. In High School, I was about 14 or 15, I began performing at a local theater program called CYT. (Christian Youth Theatre). To be involved in the shows you have to sign up each semester for a class to take. 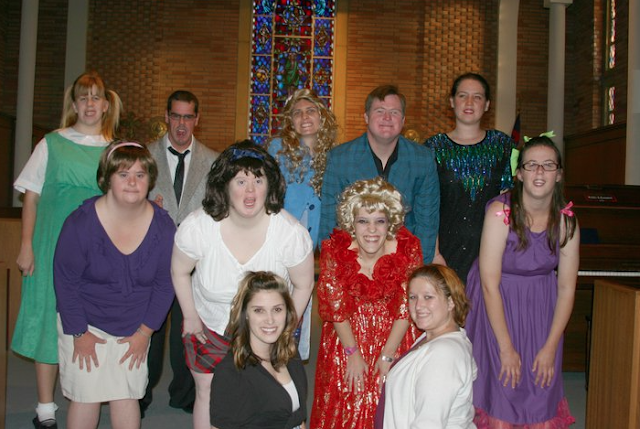 These classes range from acting, singing, dancing, stage makeup, improv, directing, ETC. And I was excited to learn that the company had it's very own class for those with disabilities. I began aiding when I was about 15 or 16. (I think 16). and I eventually became the assistant teacher/co-teacher; all while teaching the "wiggles" class, which is the tiny tiny little ones. This was my job for 7 almost 8 years and I absolutely loved every moment of it. It definitely changed my life and it's because I got to work with a group of amazing individuals, both in the Wiggles Class and Actors Unlimited Class.I couldn't have asked for a better place to spend my tuesdays and thursdays. When I talk about my time with Actors Unlimited, I always tell people, "I was the teacher, but they taught me so much more than I could ever teach them." and it's so true. Not only can I now sing every song on the High School Musical sound track but I have an even deeper understanding on why I shouldn't take life so seriously, even on my worst of days. I have walked into class crying or frustrated; and just a hug, smile, or laugh instantly changed my mood. Or the every day dance parties at the end of class when they say "Ashlee, do we need to dance it out? I think we do, turn on Hannah Montana." and by the end of a 3 minute song I am back to good spirits. I've learned to practice kindness, lots of patience, compassion, understanding, and unconditional love. They've given me so much more than I think I had ever been able to give them. And I will forever be grateful for the life-long friendships I have made. What Job are you or were you Thankful For? We are answering the question on Kenzie & Angie's Link-up.